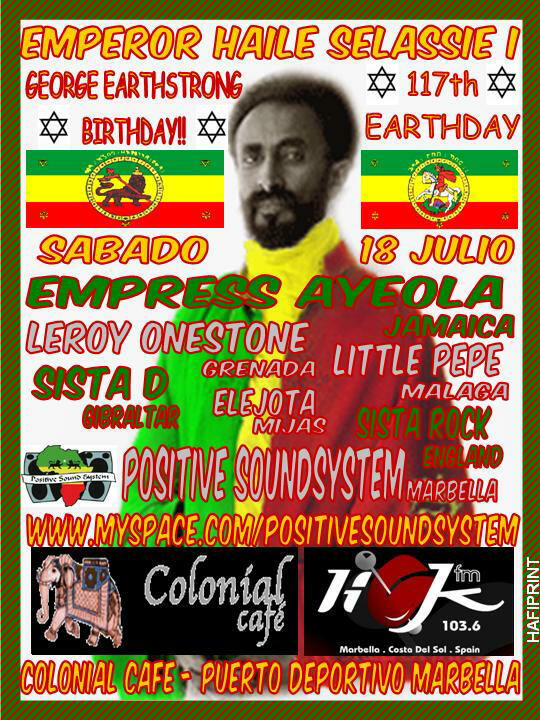 Leroy Onestone with the Malaga Wise House Band, Sista Dee also linking the Wise house Band with her player ButchSundance on lead guitar & watch this space to know who else, Lion Rock Crew will be keeping the tunes rolling with their righteous Sound System. 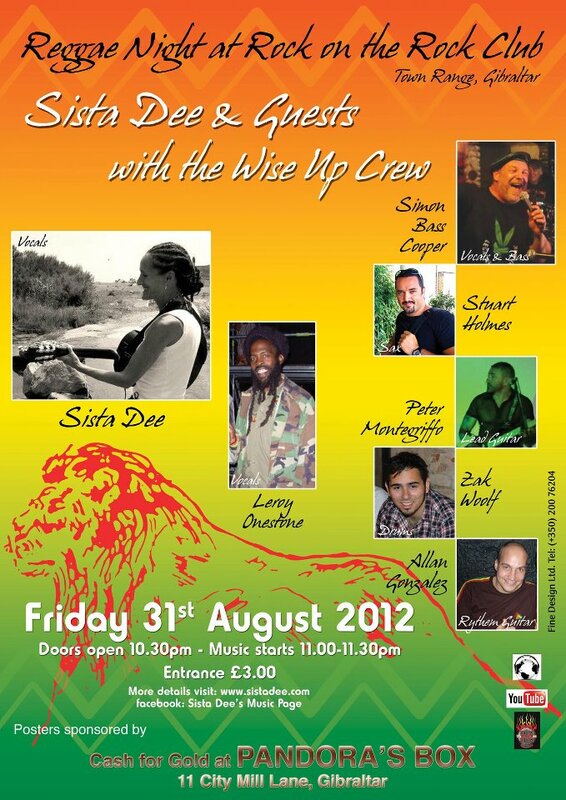 Sista Dee will be one of many musicians Playing for this Charity event! 3rd October: Live in London! 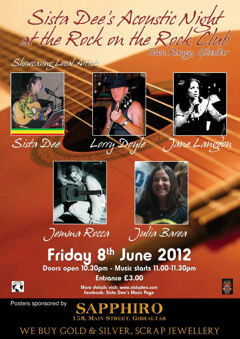 8pm Aces And Eights Saloon Bar, 156-158 Fortess Rd, Tufnell Park, NW5 2HP London, United Kingdom. 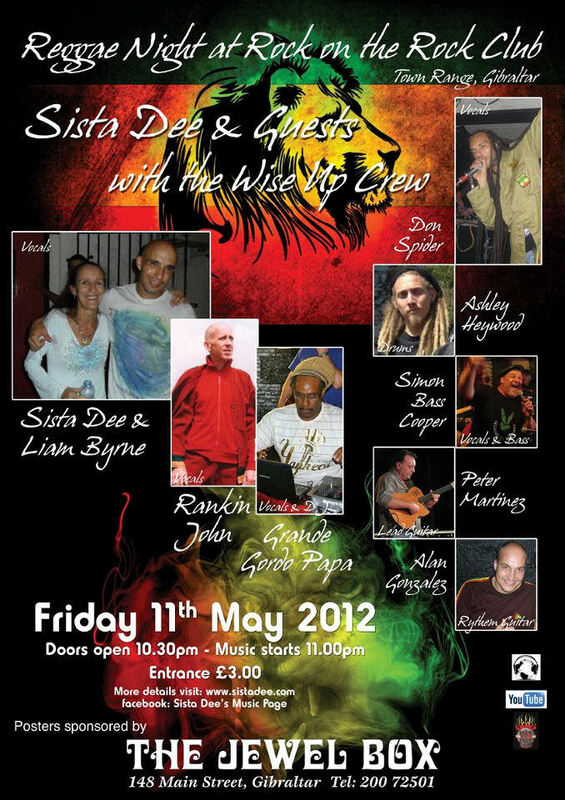 Sista Dee will be one of many musicians performing to raise money for Cancer research! 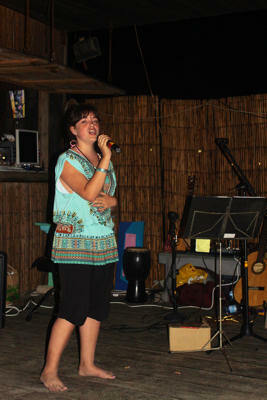 Sista Dee singing at Rock On The Rock ! 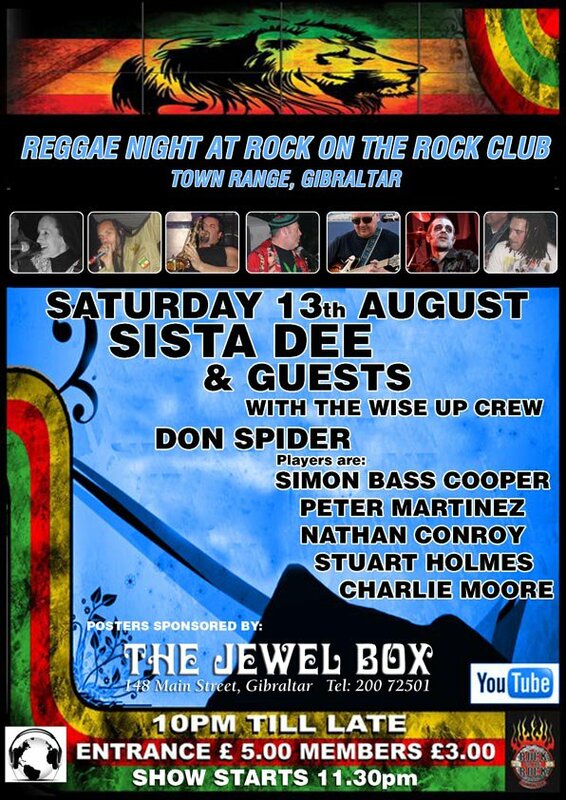 Rock on the Rock Club, entry �3 2230 till late, with many local reggae stars! See the NEW GBC documentary on our video page! 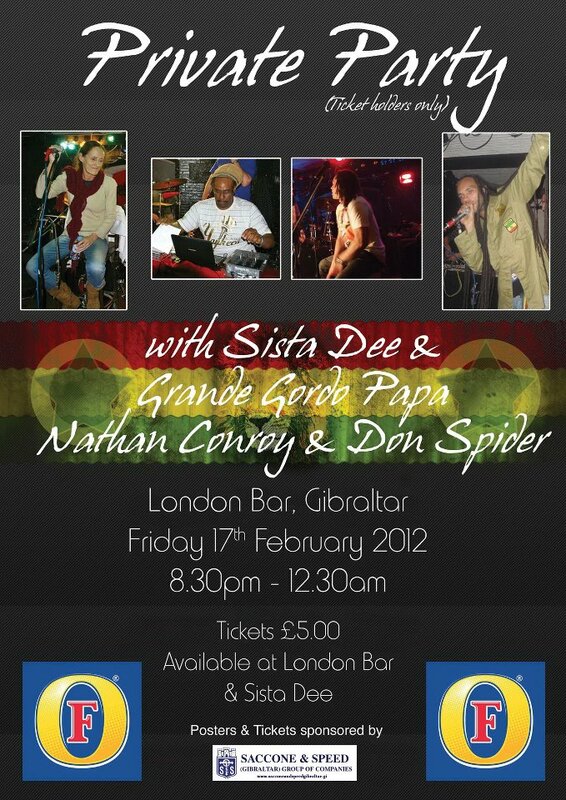 Sista Dee in Brixton, London UK! 1st of December, more details on event website! Rock on the Rock Club, Town Range, Gibraltar, 2300. 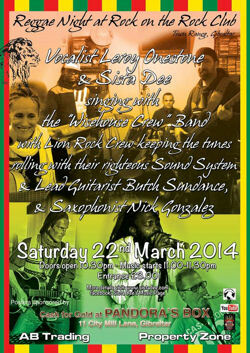 Full Band plus Special guest; International Reggae singer: Leroy Onestone! 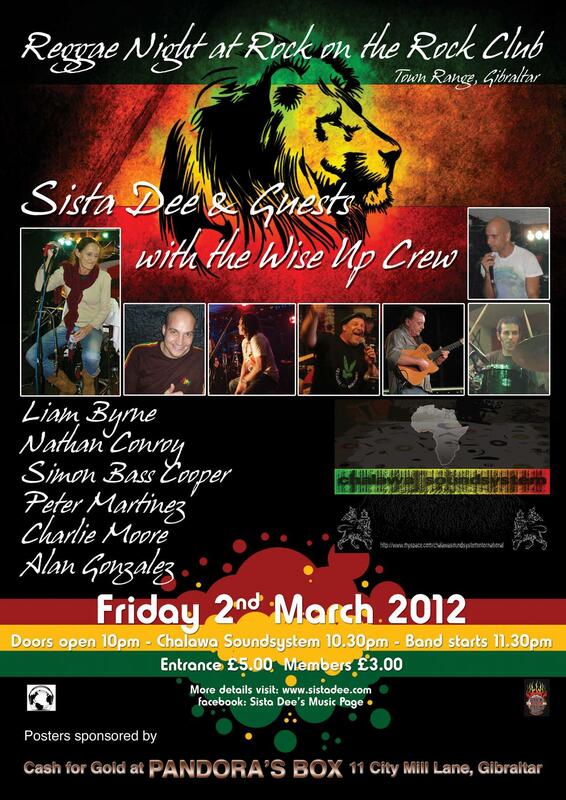 Sista Dee will be featuring in the "Battle of the Bands", Gibraltar. 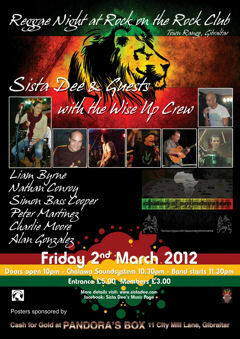 Sista Dee and some of her "Wise Up" crew will be at the Old Castellar Castle from 2200. Acoustic set with Sista Dee Then DJ Grande Papa Gordo will be ripping those rightious tunes & will be joining Sista Dee for a Lyrical free style. mmm i love beach parties :) share share share wanna see you there !! 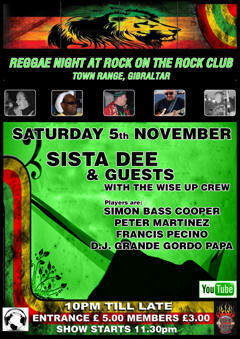 Rock on the Rock Club, Town Range, Gibraltar Doors Open 10:30pm. 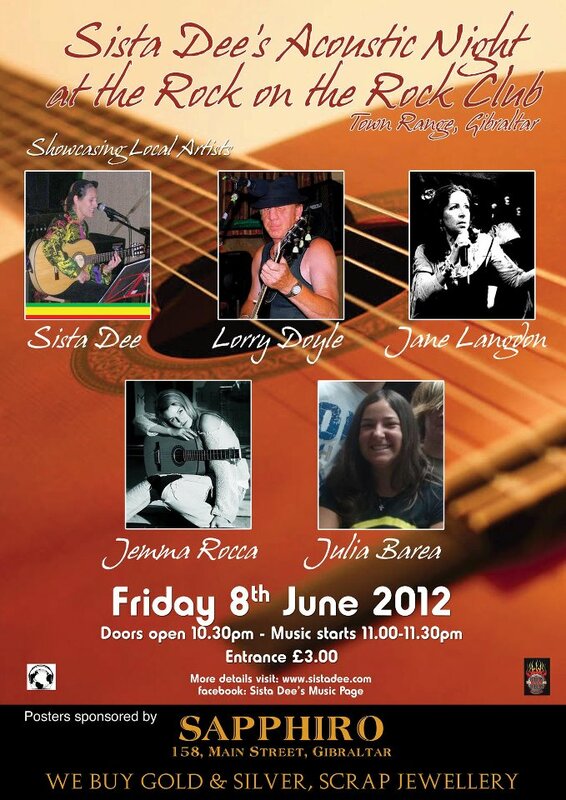 Sista Dee performing an acoustic night with Other Local Artists: Starring; Lorry Doyle, Jane Langdon, Jemma Rocca, Karima & Julia, more on the Facebook page!! 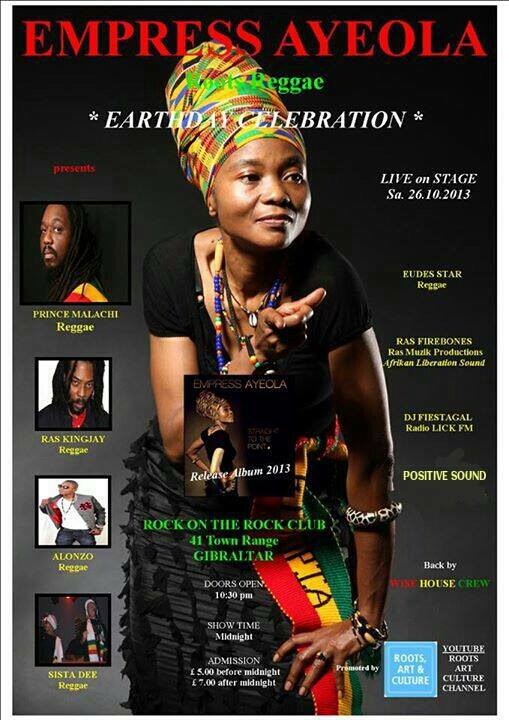 Sista Dee Will Be Guest singer at the Piazella Jubilee Party � 3 June at 11:30 at Piazella Nr the Elliots Hotel & old Theatre Royal, Gibraltar. 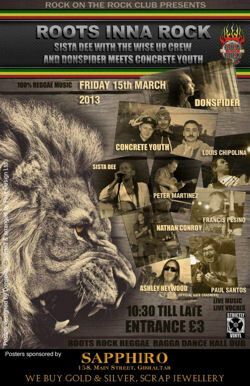 Sista Dee will be singing a couple of songs with Philip Valverde's Band. 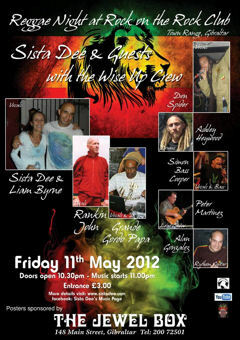 Having done Gigs at this venue b4, i can tell you it has a great Vibe ! You can eat drink & b merry at a very reasonable price! Entrance is Free ! all night Parking available ! for those who have a Tipple to many lol !! If you Don't like indoor venues this is the place for you !! Rock on the Rock Club, Town Range, Gibraltar Doors Open 10pm. 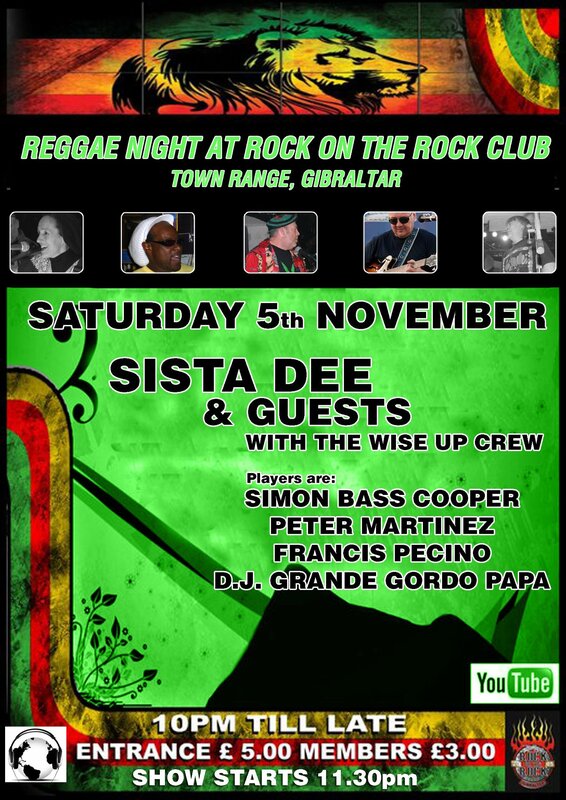 Sista Dee & band will be performing at a Reggae Night at the Rock on the Rock Club, Town Range, Gibraltar Doors Open 10pm, band starts 11:30pm. �3.00. 2012 Friday the 17th of Feb.
Saturday 12th of November 2011 Barrel House Reunion! 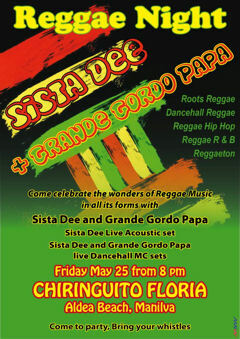 Sista Dee and many others will be performing at Gibraltar Motorcycle Club. 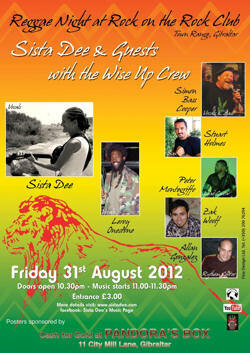 Sista Dee will be performing with her "Wise Up Crew", at The Rock On The Rock Club. Sista Dee will be performing with her "Wise Up Crew", at The Rock On The Rock Club's "Battle of the Bands". Doors open at 10pm, Admission FREE! 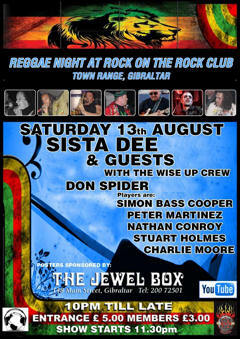 On the 30th of December 2010 Sista Dee won the Acoustic Singer song writer competition held at Rock on the Rock. 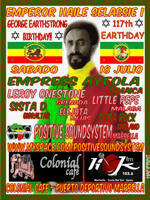 Saturday 13th Sista Dee Crew will be playing at "El Cortijo" in Castellar. See the poster for more details. 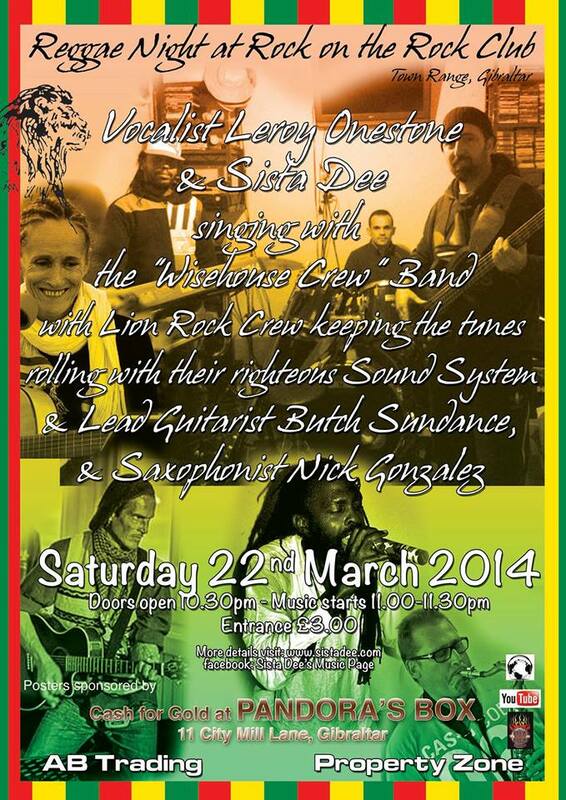 Saturday 22nd Camalots in Sabinilla, Spain, (near the beach) acoustic reggae gig with zas player Rashid, 9pm onwards. Wednesday 12th @ the Savanna, Ocean Village 9-1130pm with Callum Pilkington on lead guitar, Charlie Moor on percussion, with guest appearance by Nathaniel Conroy. 19th at "La Jarandilla", below Castillo in Castella de Frontera, Spain (1/2 hour from Gibraltar). 2pm onwards. 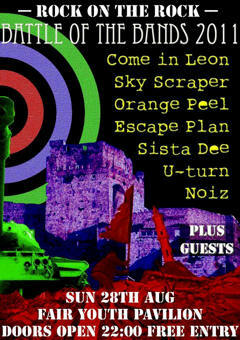 SISTA DEE and SAMANTHA GOLT will be playing at "EL CORTIJO" at the entrance to Castellar outside the castle gates. 11th April from 4pm onwards. 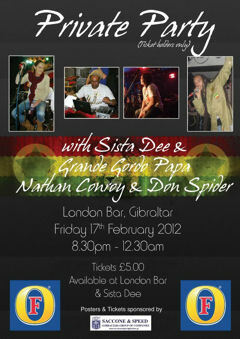 Gibraltar National Day (10th) Sista Dee will be part of the National Day concert line-up. This website available in Spanish! We learn that Sista Dee recorded backing vocals for a new song with Rankin' John while in the UK. Sista Dee is in the studio in the UK to record a new album. More as we get it. 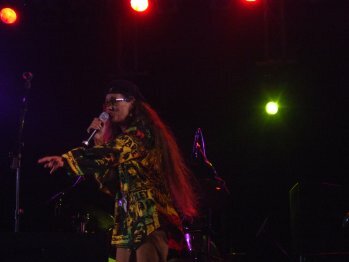 Sista Dee performs Bob Marley’s “Jamming” at the Gibraltar National Day concert. 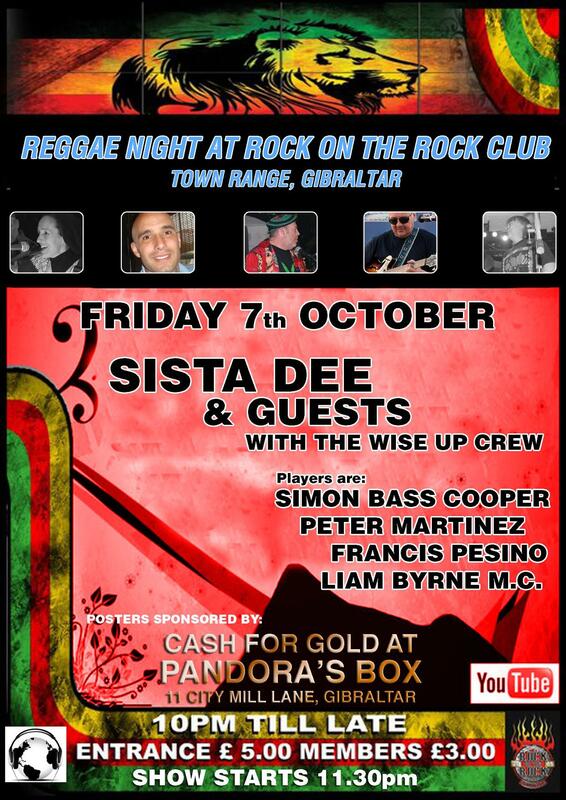 UB40 concert cancelled- Sista Dee supporting - see report on Gibraltar News Online with "Wise Up" album review.